The filmmaker takes a bold chance on casting in "The 15:17 to Paris." The Onion greeted the news that Tom Hanks will portray Mister Rogers in an upcoming film with this headline: "Tom Hanks Vows He Won't Stop Until He Has Portrayed Every Last American." The parody stems from Hanks' recent turns as legendary newsman Ben Bradlee in "The Post" and hero pilot Chesley Sullenberger in "Sully." Clint Eastwood, the director of "Sully," might be due for an Onion headline himself – beyond "Old Dude Talks to Empty Chair at GOP Convention." Eastwood’s directorial golden years have yielded films about real-life figures who faced unexpected tests – most notably Navy SEAL wartime marksman Chris Kyle, as portrayed by Bradley Cooper in "American Sniper," two years before "Sully." 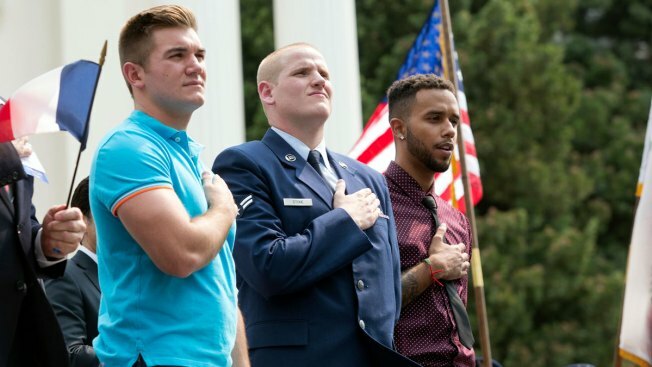 Friday brings the release of Eastwood's latest film: "The 15:17 to Paris," about three young American men who subdued a heavily armed terrorist on a Holland-to-France train in 2015. Hanks isn't taking on any roles here – the trio play themselves. It's a leap of faith, though perhaps no more so than Eastwood's past fact-inspired efforts in which the audience already knows how the tale ends – but doesn't know the whole story. That's a sign of a confident filmmaker, one still producing quality movies well into his eighties. Some might peg Eastwood as a knee-jerk cheerleader who sees the American story through the lens of a good-vs.-evil world. But that may be based more on perceptions of his politics than the content of his films. Kyle and Sullenberger emerged as fully drawn characters whose effective on-screen renderings of internal conflicts represented more than just fine acting from Cooper and Hanks. In his six-decade-plus career in the movies, Eastwood has toiled in various gradations of shadow, embodying anti-heroes from the Man With No Name to “Dirty” Harry Callahan to aging gunslinger William Munny of "Unforgiven." Those films all thrived, to different degrees, on character and suspense (“You've got to ask yourself one question: ‘Do I feel lucky?’ Well do you, punk?”). But there's little doubt Eastwood, an unstoppable cinematic force, has earned passengers on his latest ride exploring the unknowns of the known.